Set in Arco, Idaho, in 1970, Val Brelinski’s powerfully affecting first novel tells the story of three sisters: young Frances, gregarious and strong-willed Jory, and moral-minded Grace. Their father, Oren, is a respected member of the community and science professor at the local college. Yet their mother’s depression and Grace’s religious fervor threaten the seemingly perfect family, whose world is upended when Grace returns from a missionary trip to Mexico and discovers she’s pregnant with—she believes—the child of God. Distraught, Oren sends Jory and Grace to an isolated home at the edge of the town. There, they prepare for the much-awaited arrival of the baby while building a makeshift family that includes an elderly eccentric neighbor and a tattooed social outcast who drives an ice cream truck. 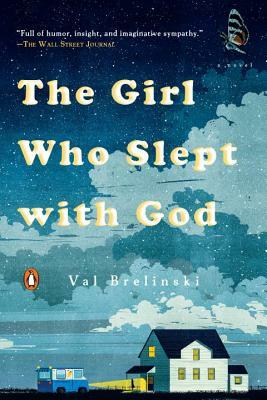 The Girl Who Slept with God is a literary achievement about a family’s desperate need for truth, love, purity, and redemption. Val Brelinski was born and raised in Nampa, Idaho, the daughter of devout evangelical Christians. She was a recent Wallace Stegner Fellow at Stanford, where she was also a Jones Lecturer in fiction writing. She received an MFA from the University of Virginia, and her writing has been published in Vogue, More, VQR, and The Rumpus. She lives in Northern California and teaches creative writing in Stanford University's Continuing Studies Program.